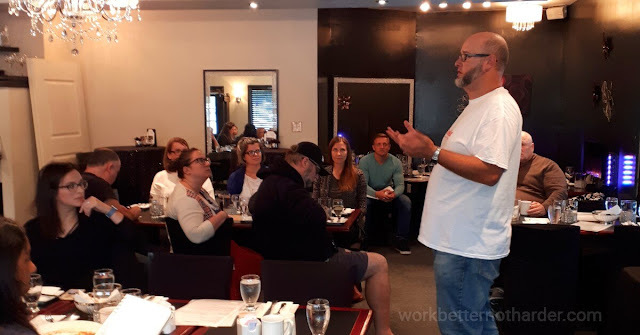 Instead, I’d like to talk about three questions that I was asked during the talk and how they relate to running your own business, podcasting or otherwise. How Much Do You Charge Someone To Sponsor a Podcast? Pricing is complicated. It’s a fact. Ask anyone who does consulting or coaching or training or anything where there’s not a defined cost or supply and demand issue, and they will tell you that pricing is one of the most difficult things to figure out. Whether you’re trying to figure out how to price your course or how much to charge for web copy or how much to charge a sponsor to be a part of your podcast, this is a question with no easy answer. I’ve been a micro-influencer at $10 per post and Kim Kardashian charges $250,000 for a picture of her using a company’s eyeliner or drinking their water. The fact is that you probably want to fall somewhere in the middle. Here’s how I think people should figure out how much to charge... for anything. It all starts with figuring out how much your time is worth. When I first started working for myself, this was a hard lesson to learn. When you work for $18 an hour for someone else and then someone asks you how much your worth, your first thought is..."I dunno... $18 an hour?" I have a calculated formula for figuring out how much I should charge for my services. Here it is, in all its glory. How much is my time worth + what value do I bring to my client x how difficult will they make my life = a dollar value. Now let me explain a little. First, how much is my time worth? Over the years, I’ve started to think about what I COULD be doing and my time is worth whatever I COULD be earning in its stead. Second, what value do I bring to my client? For my clients, I know the difference between where they’d be without me and where they are with me. That difference is the value I bring my clients. The third one? That’s a little more complicated to explain. I’ve described this before as "whether or not I like my client" and that’s not really true, nor is it really fair. The truth is that there are people that I really like that are not a great match for my business and there are people who I’m able to help that are not a good match for me personally. The real point here is, "how much work will it be to get this client to let me do my job?" When a client lets me do exactly what they hired me to do, that multiplier is 1. When a client doesn’t let me do exactly what they hired me to do, that multiplier goes up. Well, let’s say that my time is worth $100 per hour and the job will take me one hour to complete. And this project will bring $500 of value to the client. And the client lets me do my job. It’s $600. Let say that I’m worth $100 per hour and the job will take me one hour to complete and this project will bring $500 of value to the client but the client won’t follow my instructions or provide me with the assets that I require. The multiplier goes up and that $600 job becomes a $1000 job…or a $2000 job. This is not punishment. Extra work means extra time, extra effort, and the inability to take on other jobs. That time and effort and loss MUST be compensated. Will the client let me do my job? How Do I Get A Sponsor When I Don’t Have an Audience? This is yet another exceptional question. And it gets to the heart of it VERY quickly. When you launch your podcast, you have ZERO listeners. You might have your mom or your best friend or a co-worker, but essentially you have ZERO listeners. So in the beginning, how are you supposed to convince a company or a brand or an individual to sponsor your podcast? For example, I’m working on a potato chip podcast and I’m currently in discussion with a potential sponsor. Now, I have ZERO listeners to my potato chip podcast because it’s not a real thing yet. So how can I convince a sponsor that there’s value there? Right now, I have a social network of somewhere in the vicinity of 4k people. This includes all of the various platforms and lists that I’m currently connected with. In addition, I work with a number of conferences and organizations that often promote my work. So, I’m not pitching a company that I have a podcast with zero listeners. I’m pitching a company that thousands and thousands of people are going to hear all about this podcast. And the ones that like it are going to tell their friends, and they’ll tell their friends, and they’ll be very lucky to get in on the ground floor of this whole thing. Why Would You Start a Podcast That You Know You Won’t Get Paid For? There are a number of ways that you can monetize your podcast. You can sell sponsorship. You can sell advertising. You can sell a product. You can sell yourself. There’s nothing wrong with recording, publishing and promoting a podcast just because you’ve got something to say. This post has been all about the money. How do you get it? How much is enough? How do you convince companies that you’re worth it? But there’s nothing wrong with producing a podcast... or a blog... or a YouTube channel... or an IGTV account just because you feel like you want to say something. I often tell people that I started doing podcasts because I talk to myself anyway, and so I thought it might be nice to find out what other people thought about what I had to say. So yes, monetize your podcast in some fashion or another. Use your blog as a money making tool. But also know you can do something just to do it. Honestly, even if podcasting weren’t something that was helping me make a living, I’d still be doing it because I LOVE doing it. Whatever you love doing, do more of that. Do as much of that as you can. Maybe someone will pay you to do it. Maybe they won’t. But you’ll be doing something that you love. Mike Tanner is a public speaker, social media consultant, podcast host, author, conference organizer, web developer, writer, and full time dad. He lives in Halifax NS with his wife and two children.